Home » awesome duuuuuuude , board games , germany , great britain , history , monopoly , world war ii » Monopoly helped British POWs "Get out of jail free" from Nazi captors! 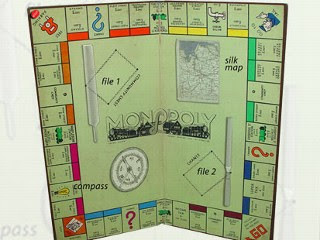 Monopoly helped British POWs "Get out of jail free" from Nazi captors! If Ridley Scott wants to make a Monopoly movie so bad, he should scrap his plans for a straight adaptation of the board game and film this instead: the ingeniously crazy and TRUE tale of how British soldiers in German POW camps during World War II used Monopoly to escape from prison. Historians are now saying that thousands of British military personnel could have literally gotten "out of jail free" and safely out of Nazi clutches... with a little help from Parker Brothers. Right when I'd thought that I'd heard every bizarre story out of World War II, then this one comes along. Just outright amazing! Mash here for more about "Monopoly: The Stalag Edition".